The Gaslight Troubadours are, apparently,"Professor Singleton Purblind and Lon Lippincott" who cite their influences to be "scratchy old cylinder recordings, risqué Music Hall, 221b Baker Street, old radio show thrillers and Hammer Horror." 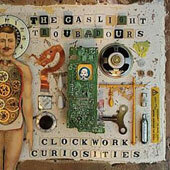 Clockwork Curiosities is the perfect title for this, their debut album, sounding as it does like the work of some old eccentric clockmaker with a musical bent, tinkering with samples and odd instruments in his basement workshop. It opens with Good Evening, a spoken word intro that sounds like the type of old radio broadcast snippet that Public Service Broadcasting would pilfer, but as the Gaslight Troubadours self-confessed influences suggest, this is a Public Service Broadcasting who spent their youth watching too many Hammer Horror movies. This is especially true on A Newly Created Being, where voices speak over some eerie Theremin-like sounds and trippy beats, whilst The Marvellous Barastro features strange effects that bring to mind the classic 60s Lost In Space TV series. I can almost picture the wonderful Dr Zacchary Smith laughing to himself over this one. Other highlights include the darker A Three Pipe Problem and the instrumental Twizzle which sounds like Tom Waits musicians playing with a looseness that could only come from them having a few beers just beforehand. Uproar In The 20's meanwhile ploughs a similar field to Madness' Last Boat To Cairo whilst the closing Elephant Man Theme genuinely sounds like an old TV theme with a scratchy sound in the background adding to the authenticity. OK, a couple of numbers, Let's Misbehave and Sam Hall, veer too closely to novelty for my liking, but this is a small complaint when there's so much fun to be had here.